Fostered with enormous business understanding of this realm, we are involved in presenting a broad consignment of Sanitary Gaskets. 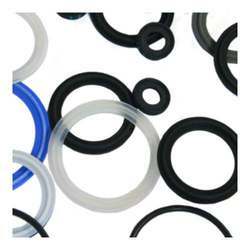 We manufactures and supplies Moulded Elastomer Gaskets and "O" Rings in sanitary designs, for all apprlications, in all sizes and range from Vitone, Silicone, EPDM, Neoprene, Nitrile etc. Triclamp sanitary gaskets of Silicone, EPDM, Viton rubber and PTFE (Teflon) are use in on-line connections, joints for sealing applications and continuity of the systems. Features: Gaskets are non-toxic, biologically inert and complies to FDA CFR177.2600 USP Class VI, requirements. (1) Range includes size: ½" to 8"
ALL sizes available…Any Size, Shape or Material special custom made sizes with no tooling cost & shortest lead time. We manufacture all types of rings for automotive and industrial applications as per customer’s specifications. All O-Rings are made according to international standards. These are ISO 3601, AS 568 A, DIN 3771 & BS 1806. 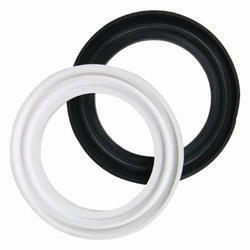 Cipriani harrison offers EPDM, buna, viton, teflon and withe silicone sanitary clamp gaskets in sizes ½ -8. All these clamp gaskets comply with the regulations and standards set forth by the FDA, USDA and 3A organizations.